"All the news that's fit to print" was once the newspaper man's slogan. Now, with news-junkies turning increasingly to the net for their daily fix of world events, papers are beginning to feel the pinch. Not since the internet began has there been so much free quality newspaper content on the web. You will have to make the most of it because the current bonanza might not last forever. I think there is no doubt that growth in electronic media is the future, but there is still a future for print. Newspapers are still not sure what to do about the internet, no matter how determined they are to prove wrong the doomsayers who claim they are dead. But Larry Killman of the World Association of Newspapers believes newspapers are "far from dead". "People have been predicting their death for years, television was going to kill newspapers, for example," he said. "I think there is no doubt that growth in electronic media is the future, but there is still a future for print." Over the years newspapers have been pretty resilient; they managed to ride out the challenge from radio and toughed it out with TV. But those challenges were more about who would be first or best with the news. The internet, however, is hitting papers where it hurts, in their pockets. "For more than 100 years journalism has been sustained by this virtuous circle in which the audience paid for their news, and the advertiser paid to reach that audience, and the publisher made a profit and paid his journalists and the society benefited into the bargain," said Michael Oreskes, executive editor of the International Herald Tribune. "That whole circle breaks down on the internet. This requires wildly creative thinking on the part of media companies to preserve the base of support that's created quality journalism for all these years. "And that's a subject that the whole of society needs to be interested in and not just those whose livelihood depends on it." The big question facing major papers is how can they compete with free. News used to be a saleable commodity, now they seem to be giving it away. 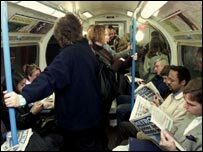 Papers like Metro have borrowed the internet's business model and make money solely through advertising. Given their fix of news, many people will not now fork out for a paper. That is hurting papers like France's Libération. It has traditionally shunned advertising it deemed politically compromising and relied on its cover price for its income. It is now in financial crisis: its doors threatening to close for good. The paper partly blames the internet. 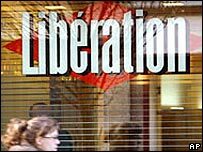 "I do think the internet is a problem, but it is also the solution," said Fabrice Rousselot, Libération's internet editor. "The mistake I think for any kind of media today would be to think they could do anything without the internet. "You have to integrate the internet as part of your business model." Which leaves papers with the problem of what, out of the pile of content they produce, should they put on the web? There is not much point, for example, putting exactly the same stuff on the website as they put in the paper. "If you offer on your website the exact same content as in your newspaper, why would people buy the newspaper? It makes no sense economically," said Mr Rousselot. "But if you show people that the content on the website is only made richer in the newspaper the next morning because what you have on the website in terms of news is becoming an analysis, is becoming a report from abroad, is becoming some kind of a huge interview on the newspaper, then there is a sense to it." While web strategy is being bandied around as the sink or swim buzzword of the moment, newspapers freely admit that no-one really knows for sure whether what they are doing is going to pay off in the end. The International Herald Tribune now sees itself as a media organisation rather than just a paper; their website features video stories and has taken the step of charging for premium content. "Good journalism costs money and so we are trying to see what we can do to make sure we can continue to grow and support the business," said Meredith Artley, director of digital development at the International Herald Tribune. "So far it is working. The advertising is growing at a huge rate and we are seeing, especially with mobile devices, that readers will pay for something they know that's valuable. "They'll do it on the web too, but with mobiles it is a little bit different. People will download things, they will pay for them. "So we are exploring that. It is still a little bit of experimentation, but that is what all this is about." These are scary times for newspapers and a crucial time for society. What will newspapers look like in 20 years?